Sakai Community DocumentationSakai 19 User Guide (English) Tests and QuizzesWhat is the Tests & Quizzes tool? Assessments in this tool fall into the two categories-- Draft Copies and Published Copies, which represent the instructor and student phases, respectively. Authoring by the instructor takes place in Draft Copies; a new assessment appears in that category. The act of publication makes the assessment available to students and moves it to the Published Copies category, where submissions and results become available. 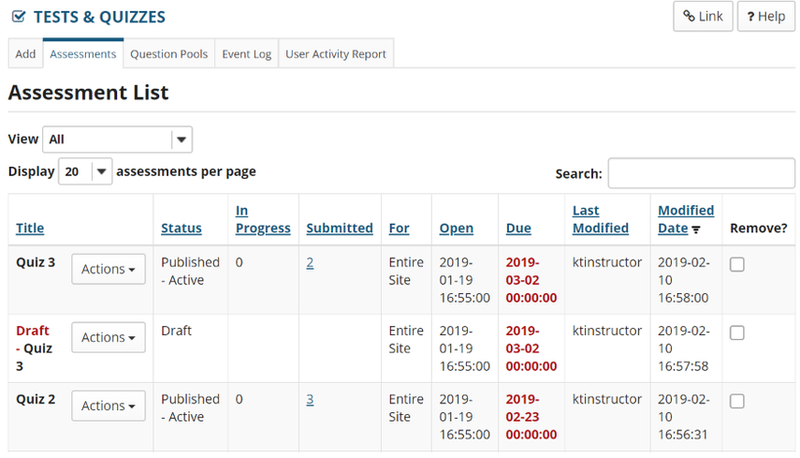 On entry, the Tests & Quizzes tool shows a list of existing assessments, Draft copies (under development) and Published copies (deployed to students).